(Photo by Eileen McMonagle) The Chester Springs Studio front entrance. During the PAFA days, acclaimed artist Daniel Garber, in his signature brimmed hat, taught in front of the Crystal Diamond Springhouse. Betsy Kelly and her daughter have enjoyed art classes at Chester Springs Studio since 1990. Betsy Kelly has her daughter to thank for her long relationship with and the Chester Springs Studio and Historic Yellow Springs. In 1990, her daughter Lisa was an engineering student at Villanova University and worked as a waitress at the Yellow Springs Inn in the village of Historic Yellow Springs. She told her mother how beautiful the area was, and that there was also something which would be of particular interest to Betsy. As a working artist, Kelly had for nearly 40 years produced bleach batik, primarily on dark denim under, the name Colly Kelly. (Her maiden name, Collishaw, is so unusual, she said with a laugh, that if she meets someone who shares the name she knows they’re related.) Betsy's items sold primarily along the East Coast, especially around Annapolis, Md., and up and down Florida, she said. “My daughter said, ‘Hey Mom, did you know there was a studio down there?’” Kelly recalled. She didn’t know, but that was all she had to hear. Over the years, Kelly fit in a variety of classes at the studio, and especially enjoyed being in a class of like-minded folks. Because of the nature of her occupation, “I hadn’t had the experience of working with other people,” she said. 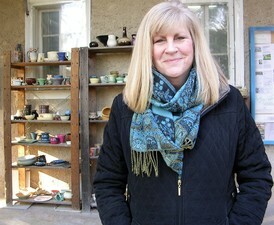 After she finally decided to retire from her business, the West Goshen resident started taking more classes, but she was drawn to one type in particular: ceramics, for which Chester Springs Studio is known nationally. Betsy told the story of walking into a studio class for the first time, and finding out it was being taught by her ceramics teacher from Conestoga High School, Paul Bernhardt. She said she continues to be impressed by the variety of instructors. “People can do the most amazingly different work and they’re still able to teach it to others,” she said. Kelly has since changed her focus to making pottery, and has had success for about the last five years, selling her works through area galleries. She also finds that her more whimsical pieces – decorated with images of birds and frogs -- are her most popular. Originally formed in 1978, the Chester Springs Studio was the continuation of a strong arts background in the village, said Historic Yellow Springs Executive Director Eileen McMonagle. The village itself, which includes 11 buildings and 142 acres, was originally owned by The Pennsylvania Academy of the Fine Arts, and formed as a non-profit in 1974. It was purchased by neighbors concerned about its preservation, who formed the Historic Yellow Springs, Inc. In addition to ceramics, the studio offers classes in sculpture, drawing and painting. 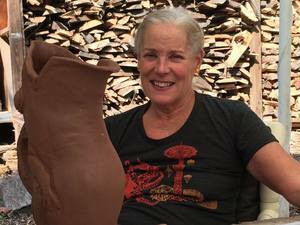 But its wood-fired kiln, that turns clay into ceramics, is a draw for artists and art students “basically from five hours around the studio,” McMonagle said. “We’ve had people from Philadelphia, up from Baltimore and Lancaster.” Students from St. Joseph’s University and Temple University’s Tyler School of Art, and other art centers, are also regulars. “There was an active arts program here that they wanted to continue,” McMonagle said. The Chester Springs Studio, founded by Connie Fraley and Lindsay Brinton, was deeded by the association four years later. Its focus was on the arts, and Historic Yellow Springs, Inc., focused on the history of the village. But costs necessitated the studio merge with Historic Yellow Springs, Inc., at the end of 2007, McMonagle said. “This winter session, I would say we have the most students taking classes than we have had in the past 10 years,” she said. McMonagle attributes the continued popularity of the studio to the work of her staff, social media, and “wonderful students who love coming back.” She said the sense of community is very strong among students and instructors at the studio. For 2018, the studio’s 40th anniversary, McMonagle said they are in the midst of planning some special events, and are hoping people who were involved in the studio’s earlier days will come back to participate. Many of the studio’s instructors are involved in this year’s Yellow Springs Art Show, which is held April 29 through May 14. “In the spring, you see the thousands of daffodils planted throughout the village. It’s a wonderful reawakening,” McMonagle said. More than 3,500 pieces of original art by 206 predominantly local artists will be on display at this juried show, much of it in the Lincoln Building, where the administrative offices are. “There’s a lot of art here,” McMonagle said, laughing. “We have 5,000 square feet of gallery space in this building.” The show itself is run by more than 40 volunteers and chaired by Maureen Fendrick. For Betsy Kelly, the Chester Springs Studio at Historic Yellow Springs, where she now goes as often as three times a week, is a place where she feels comfortable and inspired. “Other art centers are wonderful, but there gives you the feeling of history. The beauty and architecture of the village … that’s kept me there. That, and the wonderful people,” she said. 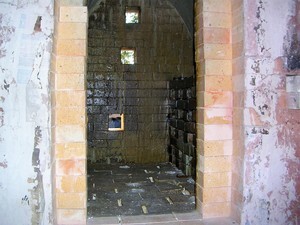 More information about the Chester Springs Studio and Historic Yellow Springs is available at www.yellowsprings.org.